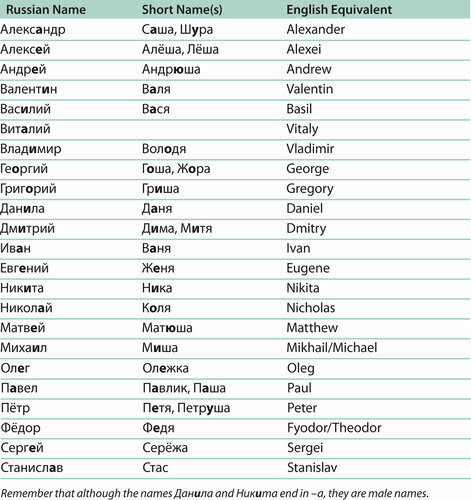 An "a" is added to the end of most (but not all) surnames of Russian females. It is common and considered polite to address people you do not know very well and/or that are older than you by their first name and patronymic. Russians rarely refer to each other by their first and last names, although some - especially the younger generation - will call each other by their last names. You might hear children shout something like "Hey Smirnova" or "Hey Smirnov". If you are trying to find someone and only know that person's first and last name, you can ask for "Gospozha Tatiana Smirnova" (Mrs. Tatiana Smirnova) or "Gospodin Sergey Smirnov" (Mr. Sergey Smirnov). A Russian woman usually adopts her husband's last name after marriage, but there are exceptions. Common female names are Anna (Anya), Ekaterina (Katya), Elena (Lena), Irina (Ira), Yulia (Yulya), Maria (Masha), Natalia (Natasha), Olga (Olya), Svetlana (Sveta), Tatiana (Tanya), etc. Names of females are often altered even further, especially in terms of endearment between close friends. Thus Masha can turn into Mashenka, Lena into Lenochka, and Anya into Anyuta. Lyuba can become Lyubochka, and Yulia is often called Yulka or Yulechka. Coining these "pet-name" versions is an art in itself, and the mutual freedom to use them is considered part of the friendship bonding process. You may find your own (foreign) name converted to a nickname version - don't be offended, it is a sign of warm friendship. 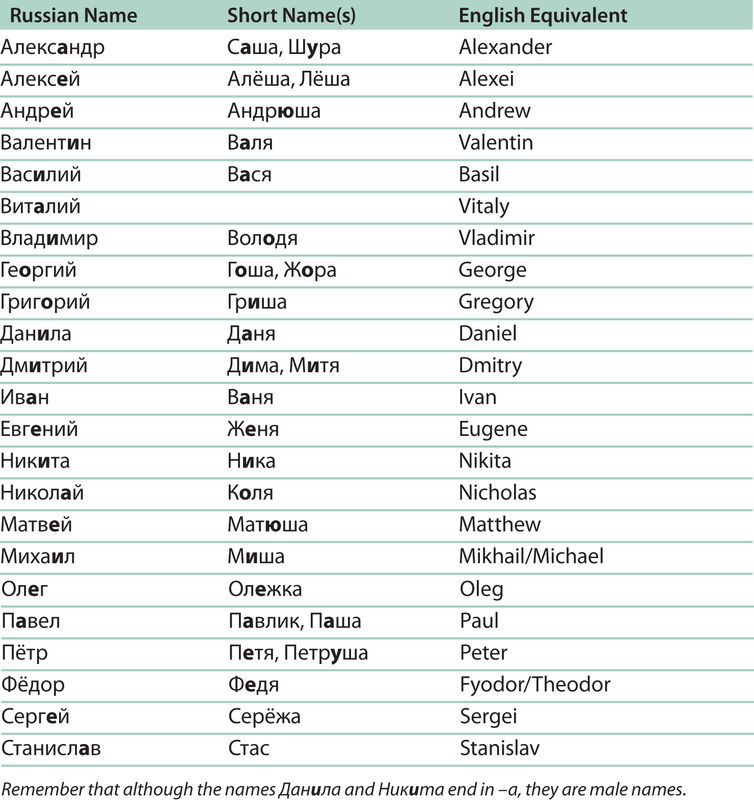 Common male names are Alexander (Sasha, Shura, Sanya), Dmitry (Dima), Eugeny (Zhenya), Ivan (Vanya), Mikhail (Misha), Nikolai (Kolya), Sergey (Seryozha), Victor (Vitya), Vladimir (Volodya, Vova), etc. Often the names in parentheses are shortened even further, Seryozha can turn into Seryozh or Seryoga, Mikhail into Mish or Misha. A modern friendly jokey way of referring to friends (rather than merely "colleagues") at work (but not superiors!) is to employ 19th century habit of using a shortened version of their patronymic - the way 19th century employers would talk to their servants. Thus Nikolai Ivanovich might be "Ivanych" to his work chums, and "Elena Ivanovna" might be "Ivanovna". Wait until you are proficient in Russian before using this in practice. If you can pull it off in practice, it will win you friends. Obviously it has to be done with a sense of fun - or it would cause offence. The shortened names given in parentheses are commonly used, but you should never use them without asking permission. Not every Elizaveta wants to be called Lisa and not every Vladimir likes being addressed as Vova - it would be considered as "excessive familiarity". Beware of using them to people "lower in the pecking order" than yourself - you might end up patronizing people instead of befriending them as you hoped. The shortened names Sasha and Zhenya are used for both females and males. Another important thing to remember is that the Russian language - much like French and German - has two separate pronouns for the second person singular, differing in degrees of politeness. Technically, there are two words for the second person singular: "ty", which is used in the same sense as the French "tu" and the German "du"; and "Vy". Note that this word starts with a capital letter, which is similar to the French "Vous" and the German "Sie". Except for children you should never address anybody with the personal "ty" without asking for their permission. The word for the second person plural pronoun is also "vy" but it is spelled with a small letter. The most common form of address in today's international office environment is first names in combination with the formal "Vy"; colleagues occupying the same rank may also use the personal "ty".